Home > Blog > Ambient Mechanical Wins Johnson Controls' Gold ASI Award "Best of the Best"
CONCORD, ON - Ambient Mechanical Ltd. has been awarded the top Gold Award of Excellence by Johnson Controls Canada for superior service in heating, ventilation and air conditioning (HVAC), and specifically in the Building Automation Systems (BAS) and Facility Explorer product. 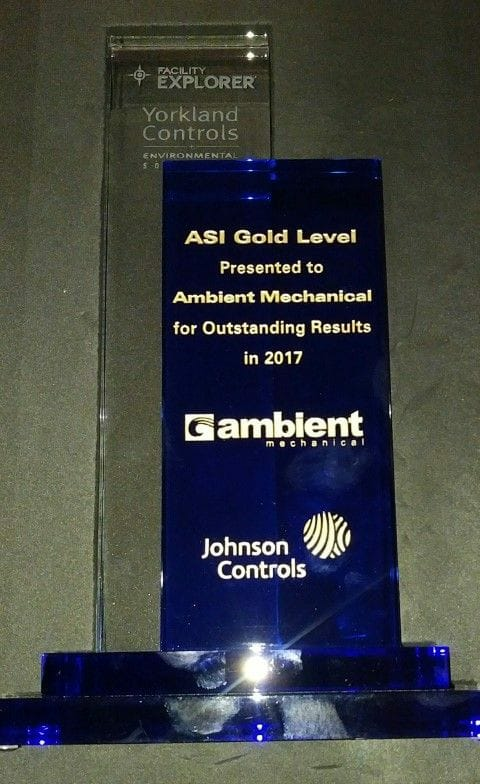 The Gold ASI (Authorized System Integrator) Award, presented on October 26, 2017, at a ceremony in Richmond Hill, Ontario, recognizes Ambient as a leader in the industry, through the quality of its work and its relationships with suppliers and customers. "We are proud of our work and proud to earn this recognition as a leader in HVAC and BAS Controls," said Tony Mammoliti, Ambient's Partner and Vice President, Operations. "We have grown over three decades to serve the most important commercial, industrial and multi-residential buildings in Canada, but we always remember our roots and our focus a well-trained staff working with top-quality equipment, such as Johnson Controls' Facility Explorer product and providing the best possible customer service." "Ambient is right now the only Gold contractor in Canada," said Scott McDonald, Johnson Controls Canada's Account Manager for Ontario and Eastern Canada. "The award is our highest award. It recognizes that Ambient has done everything it can do to be the best," Mr. McDonald added. "This is the second year in a row that Ambient has won. They represent the best of the best. To achieve this, they need to have a certain number of trained individuals in the company and do a significant amount of business." The award was presented at a ceremony at the Richmond Hill Golf and Country Club by Mr. McDonald, along with Johnson Controls' Director of Sales Dan Preston, and Gerry Cellucci, Vice President of Systems at Yorkland Controls, the distributor of Johnson's systems. "It's another great year for Ambient. We're pleased to recognize and honour them," Mr. Cellucci said. Ambient Mechanical Ltd. was founded in 1982, and has grown to become one of Canada's most sought- after and respected HVAC firms, providing quality and professional Heating, Ventilation, Air Conditioning and Building Automation control systems and services to valued and long-standing customers.